Michael Hainey had just turned six when his uncle knocked on his family’s back door one morning with the tragic news: Bob Hainey, Michael’s father, was found alone near his car on Chicago’s North Side, dead, of an apparent heart attack. Thirty-five years old, a young assistant copy desk chief at the Chicago Sun-Times, Bob was a bright and shining star in the competitive, hard-living world of newspapers, one that involved booze-soaked nights that bled into dawn. And then suddenly he was gone, leaving behind a young widow, two sons, a fractured family—and questions surrounding the mysterious nature of his death that would obsess Michael throughout adolescence and long into adulthood. Finally, roughly his father’s age when he died, and a seasoned reporter himself, Michael set out to learn what happened that night. Died “after visiting friends,” the obituaries said. But the details beyond that were inconsistent. What friends? Where? At the heart of his quest is Michael’s all-too-silent, opaque mother, a woman of great courage and tenacity—and a steely determination not to look back. 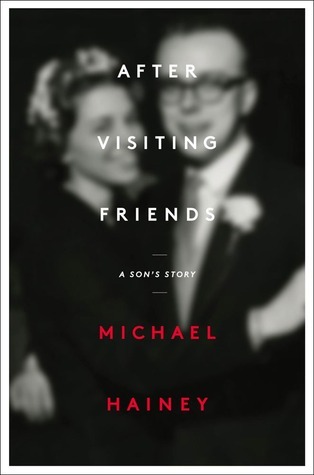 Prodding and cajoling his relatives, and working through a network of his father’s buddies who abide by an honor code of silence and secrecy, Michael sees beyond the long-held myths and ultimately reconciles the father he’d imagined with the one he comes to know—and in the journey discovers new truths about his mother. Thank you to Scribner for sending me this wonderfully written and illuminating memoir. Thank you to Michael Hainey for sharing his deeply personal story with all of us. This book sounds crazy fascinating -- and the cover design is stunning, which is always a plus. I need to read more personal, investigative, journalistic things! I agree. I think the book, at first blush reading about it, didn't sound that exciting, but as I read more, it really sounds fascinating. I wasn't quite sure about this at first either. But once I started reading I was all in :) Thanks so much for visiting me here! This sounds so good! I'm so glad you wrote about it or I wouldn't have heard about it. Thanks! You've got me curious about this one! Family mysteries like this are always really intriguing. Sounds like a good read! After Visiting Friends sounds like an intriguing memoir. Thanks for the recommendation. You're welcome :) This is a great read!